The Land of Stories: An Author's Odyssey (Paperback) | Let's Play Books! The Masked Man has captured all the royal families from the Land of Stories with the help of his army of literature's greatest villains, including the Wicked Witch of the West, the Queen of Hearts, and Captain Hook. With his sinister plan finally in motion, he is eager to destroy the families and take his place as emperor. Alex and Conner know they are no match against the Masked Man's legion of villains, but they realize that they may be in possession of the greatest weapon of all: their own imaginations! So begins the twins' journey into Conner's very own stories to gather an army of pirates, cyborgs, superheroes, and mummies as they band together for the ultimate fight against the Masked Man. Meanwhile, an even more dangerous plan is brewing--one that could change the fates of both the fairy-tale world and the Otherworld forever. 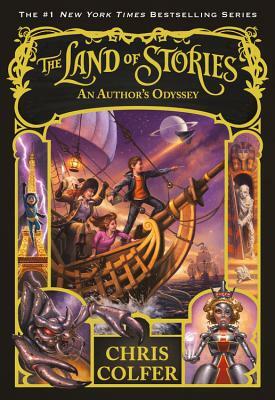 Conner's tales come alive in the thrilling fifth adventure in the #1 New York Times bestselling Land of Stories series. Chris Colfer is a #1 New York Times bestselling author and Golden Globe-winning actor. He was honored as a member of the TIME 100, Time magazine's annual list of the one hundred most influential people in the world, and his books include Struck By Lightning: The Carson Phillips Journal, Stranger Than Fanfiction, and the books in The Land of Stories series: The Wishing Spell, The Enchantress Returns, A Grimm Warning, Beyond the Kingdoms, and An Author's Odyssey, and the companion books A Treasury of Classic Fairy Tales, The Mother Goose Diaries, Queen Red Riding Hood's Guide to Royalty, The Curvy Tree, and Trollbella Throws a Party.